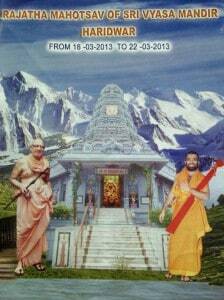 Sri Vyasa Ashram of our Shree Kashi Math Samsthan, Haridwar will celebrate Rajath Mahostsav (Completion of 25 years) of Sri Vyas Mandir from 18/03/2013 to 22/03/2013 at Haridwar. We are fortunate, our Dharmaguru, H.H Shrimath Sudheendra Thirtha Swamiji, Mathadipathi of Shree Kashi Math Samsthan, along with their Patta Shisya H.H Shrimath Samyamindra Thirtha Swamiji will grace us on the occasion and bless all the shishyavargas attending the function. We consider ourselves blessed that His Holiness has bestowed upon us the Seva Samrpan Bhagya during this period in response to our vinanthi to serve Hari Guru. It is our ardent desire that you shall share in our fortune along with your family by actively participating during this function. 2) Samaj Bhandhavas/ Institutions are reuested to sent their email id so that we can update you on events time to time. places from where Upasana starts. GSB Samaj Delhi will provide all facilities free of cost to Samaj Bandhavas.